All girls should have a handbag like the Maison Martin Margiela East/West Tote. 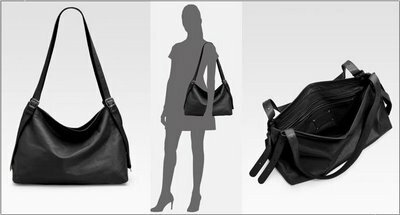 This black leather tote with adjustable shoulder straps, a zippered top and plenty of storage space (15.5 x 11 x 7) is an essential asset in any woman's wardrobe. The key to such a classic, and, yet, nondescript bag is to find one that will compliment any ensemble without looking boring. The MMM East/West Tote achieves this with ease delivering a sophisticated look for under $1000.